Nest Labs is an American manufacturer of smart home products including thermostats, smoke detectors, and security systems including smart doorbells and smart locks. Its flagship product, which was the company's first offering, is the Nest Learning Thermostat that was introduced in 2011. The product is programmable, self-learning, sensor-driven, and Wi-Fi-enabled – features that are often found in other Nest products. It was followed by the Nest Protect smoke and carbon monoxide detector in October 2013. After its acquisition of Dropcam in 2014, the company introduced its Nest Cam branding of security cameras beginning in June 2015. Co-founded by former Apple engineers Tony Fadell and Matt Rogers in 2010, the company quickly expanded to more than 130 employees by the end of 2012. Google acquired Nest Labs for US$3.2 billion in January 2014, when the company employed 280. As of late 2015, Nest employs more than 1,100 and added a primary engineering center in Seattle. Nest Labs was founded in 2010 by former Apple engineers Tony Fadell and Matt Rogers. The idea came when Fadell was building a vacation home and found all of the available thermostats on the market to be inadequate, motivated to bring something better on the market. Early investors in Nest Labs included Shasta Ventures and KPCB. On January 13, 2014, Google announced plans to acquire Nest Labs for $3.2 billion in cash. Google completed the acquisition the next day, on January 14, 2014. The company would operate independently from Google's other businesses. In June 2014, it was announced that Nest would buy camera startup Dropcam for $555 million. With the purchase, Dropcam became integrated with other Nest products; if the Protect alarm is triggered the Dropcam can automatically start recording, and the Thermostat can use Dropcam to sense for motion. Later that year, Nest acquired the hub service Revolv but did not continue its product line. In September 2014, the Nest Thermostat and Nest Protect became available in Belgium, France, Ireland and the Netherlands. Initially they are sold in approximately 400 retail stores across Europe with another 150 stores to be added by the end of the year. In June 2015, the new Nest Cam, replacing the Dropcam, was announced, together with the second generation of the Nest Protect. In August 2015, Google announced that it would restructure its operations under a new parent company, Alphabet Inc., with Nest being separated from Google as a subsidiary of the new holding company. The restructuring led to Tony Fadell, the Nest CEO, to announce in a blog post in June 2016 that he was leaving the company he founded with Matt Rogers and stepping into an "advisory" role. It culminated after months of rumors about Nest's demanding corporate culture under Fadell's leadership, and the displeasure of former Dropcam CEO Greg Duffy, who openly regretted selling his company to Nest. By June 2016, the Nest acquisition was described by some press as a "disaster" for Google. Nest's problems in 2016 stem in a large part due to a limited market. According to Frank Gillet of Forrester Research, only 6% of American households possess internet-connected devices such as appliances, home-monitoring systems, speakers, or lighting. He also predicted this percentage to grow to only 15% by 2021. Furthermore, 72% of respondents in a 2016 survey conducted by Pricewaterhouse Coopers did not foresee adopting smart-home technology over the next two to five years. On February 7, 2018, it was announced by hardware head Rick Osterloh that Nest had been merged into Google's hardware division, directly alongside units such as Google Home and Chromecast. It would retain its separate Palo Alto headquarters, but Nest CEO Marwan Fawaz would now report to Osterloh, and there were plans for tighter integration with Google platforms and software such as Google Assistant in future products. Shortly after the announcement, co-founder and chief product officer Matt Rogers announced that he planned to leave the company. On July 18, 2018, Nest CEO Marwan Fawaz stepped down. Nest was merged with Google's home devices team, led by Rishi Chandra. The Nest Learning Thermostat is an electronic, programmable, and self-learning Wi-Fi-enabled thermostat that optimizes heating and cooling of homes and businesses to conserve energy. It is based on a machine learning algorithm: for the first weeks users have to regulate the thermostat in order to provide the reference data set. Nest can then learn people's schedule, at which temperature they are used to and when. Using built-in sensors and phones' locations it can shift into energy saving mode when it realizes nobody is at home. The Nest Thermostat is built around an operating system that allows interaction with the thermostat via spinning and clicking of its control wheel, which brings up option menus for switching from heating to cooling, access to device settings, energy history, and scheduling. Users can control Nest without a touch screen or other input device. As the thermostat is connected to the Internet, the company can push updates to fix bugs, improve performance and add additional features. For updates to occur automatically, the thermostat must be connected to Wi‑Fi and the battery must have at least a 3.7 V charge to give enough power to complete the download and installation of the update. The operating system itself is based on Linux 2.6.37 and many other free software components. Nest is currently available for sale in the United States, Canada, Mexico, the United Kingdom, Belgium, France, Ireland, the Netherlands, Germany, Austria, Italy, and Spain. It is, however, compatible with many heating and cooling automation systems in other countries. Nest Labs have surveyed existing users known to be outside the areas where it is officially available. Use of the thermostat outside the United States and Canada is complicated by the software setting time and other functions based on the ZIP code. For international users this means they must either disable Wi‑Fi to set the time correctly or use the nearest U.S. zipcode which may result in erratic behavior as the thermostat makes faulty assumptions about inactivity corresponding with either sleep or the home's occupants being away. In September 2017, Nest released the Thermostat E, a lower-priced version of the original Nest Thermostat. It is similar in functionality to the standard model, except with a plastic, ceramic-like bezel ring (instead of metal) and a "frosted" overlay for its display. Unlike the original, the screen only activates when the device is being used; these design changes are intended to make the device appear more natural within a home. 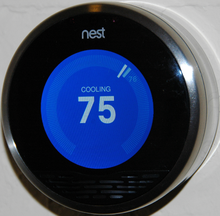 The Thermostat E also does not feature as many wiring connectors as the higher-end model; Nest stated that this would make it support at least 85% of homes (as opposed to 95% for the standard model). In October 2013, Nest announced its second product, the Nest Protect smoke and carbon monoxide detector. The Nest Protect is available in both black and white (the black is exclusively sold through Nest directly) and also comes in battery or AC-powered models. The Nest Protect features a multicolored light ring which is color-coded to indicate different operations, such as yellow to indicate an early warning or red if an alarm is sounding. The ring also has a motion detector which turns it white briefly when someone passes under to provide illumination. The Nest Protect is voice-activated and warns of an alarm sounding briefly before it does. It is also able to communicate with the Nest Thermostat to provide the Auto-Away feature information that someone is present in the house, as well as to shut off the furnace in the event of a fire or carbon monoxide. The Nest Protect also features a controversial Wave Silence feature to stop an alarm from sounding with a wave in the event of a potential false alarm. It is available for sale in the United States, Canada, the United Kingdom, Belgium, France, Ireland and the Netherlands. On April 3, 2014, sales of the Nest Protect were suspended, due to the potential for the alarm feature to be accidentally disabled. 440,000 existing Nest Protect units were recalled because of this problem on May 21, 2014 and a software update was distributed to disable this functionality. On June 17, 2015, Nest launched a new version of the Nest Protect. It is the first smoke alarm to bring a commercial–grade photoelectric sensor to the home; called the Split-Spectrum Sensor – it uses two wavelengths of light to spot different kinds of smoke, which helps it catch both fast and slow-burning fires quickly. Additionally, due to the long-lasting carbon monoxide sensor, the Nest Protect lasts ten years. The new Nest Protect also has a feature called App Silence which lets you silence it using your smart device if you are not in the US or Canada. Also, when you are not home, the smoke detector will test itself using a built in microphone. Safety Rewards allows Nest Protect users that have their insurance through American Family and Liberty Mutual to get savings off their bill. In June 2014, Nest acquired Dropcam, maker of the Dropcam security camera. In June 2015. Nest announced the Nest Cam, an upgraded and rebranded security camera based on the Dropcam. Features are a 1080p video resolution, a rotating, magnetic stand, night vision, two-way talk, sound and motion alerts and optional Nest Aware cloud services for an additional fee. It was renamed Nest Cam Indoor following the announcement of the Nest Cam Outdoor in July 2016. Several security flaws with Nest Cam products were reported in March 2017, allowing a burglar to hack the camera's always-on Bluetooth signal and stop recording. Nest released a security update later that month that fixed the vulnerabilities. Nest Cam Outdoor was announced in July 2016, and is a version of the Nest Cam adapted for outdoor monitoring. The main differences from the Nest Cam Indoor is in its design which is built to withstand outdoor conditions. Nest Cam IQ was announced in June 2017, and is a more premium model of their Nest Cam Indoor. It features a 4K camera sensor with HDR. It also comes with the ability to recognize and distinguish between different faces when using the Nest Aware service. It also has several minor upgrades, such as better wi-fi connectivity, brighter infrared LEDs, a more powerful speaker in addition to added microphones, and a close-up tracking view, which zooms in on action occurring within view of the camera. A weatherproof outdoor model was announced in September 2017. The indoor version of the Cam IQ also received an update to add Google Assistant functionality to the device in 2018. Nest Secure is a home security system announced in September 2017. The system consists of Nest Guard (an alarm, keypad, and motion sensor with embedded microphone), Nest Detect (a door/window and motion sensor), and Nest Tag (a key chain fob). The product was released in November 2017. Nest also has a partnership with Brinks Home Security for a monthly plan so that the Nest Protect system can be professionally monitored. In February 2019, the Nest Guard received an update to add Google Assistant, allowing it to effectively double as a smart speaker similar to Google Home for general voice commands. This addition has faced criticism, as the presence of a microphone inside the device was not adequately disclosed in product specifications. Google stated that the inclusion of a microphone was accidentally excluded from the listed specifications, and was originally intended to enable future sensor functionality. Nest Hello is a hardwired smart video doorbell with facial recognition. The device was originally slated to launch in February 2018 but was delayed until March in the United States and Canada. The Hello was launched in the UK in May 2018. Nest × Yale is a smart lock produced in collaboration with Yale, released March 2018. It is connected to Nest Connect or Nest Guard. Works with Nest is a program that allows third party devices to communicate with Nest products. Nest products can be controlled with the Google Assistant and Amazon Alexa virtual assistants, along with many third-party home automation platforms. Additionally, many smart device manufactures have direct integration with the Nest platform, including Whirlpool and GE Appliances. In February 2012, Honeywell filed a lawsuit claiming that some of its patents had been infringed by Nest; Nest has said that it will fight the lawsuit. On April 12, 2012, Nest publicly announced they will see Honeywell all the way to court as they believe that none of the seven allegedly infringed patents were actually violated. Honeywell is claiming that Nest has infringed on patents pertaining to remotely controlling a thermostat, power-stealing thermostats, and thermostats designed around a circular, interactive design, similar to the Honeywell T87. However, Honeywell held patents that were almost identical to those that expired in 2004. Nest has taken the stance that they will see this through to a patent court as they suspect Honeywell is trying to harass them, litigiously and financially, out of business. On May 14, 2013, Allure Energy, Inc. ("Allure") was issued a patent by the USPTO titled "Auto-Adaptable Energy Management Apparatus." The very same day, Allure filed a lawsuit against Nest and two other defendants in the Eastern District of Texas alleging Nest was infringing their newly issued patent; the lawsuit is ongoing. On September 11, 2013, Nest announced that it entered into a patent license agreement with Intellectual Ventures. Additionally, Nest announced that it was acquiring several of Intellectual Venture's patents that will help Nest to better defend their products from patent infringement claims. It is unclear how many patents Nest licensed and purchased from Intellectual Ventures. On November 4, 2013, BRK Brands, Inc. ("BRK"), maker of the First Alert brand of smoke detectors, filed a lawsuit against Nest in the Illinois Northern District Court alleging Nest's newly released Nest Protect product infringes claims from six of its patents. In 2016, Nest announced that the devices of Revolv customers would be bricked on May 15, as they were shutting down the necessary cloud software. Karl Bode and Emmanuel Malberg of Vice News compared the move to a remote deletion of purchased Xbox Fitness content by Microsoft. In February 2016, the Federal Trade Commission's Division of Advertising Practices opened an investigation into whether Nest Labs, Inc. violated Section 5 of the Federal Trade Commission Act, 15 U.S.C. § 45, in connection with Nest's decision to shut down the services necessary to operate its Revolv “Smart Home Hub”. All customers were offered full refunds and the investigation was closed On July 7, 2016. In May 2016, an employee filed an unfair labor practice charge with Region 32 of the National Labor Relations Board against Nest and Google. In the charge, the employee alleged that he was terminated for posting information about Tony Fadell's poor leadership to a private Facebook page consisting of current and former employees. The charge also alleged that Nest and Google had engaged in unlawful surveillance and unlawful interrogation of employees in order to prevent them from discussing the work environment at Nest. On May 7, 2014, German activist group Peng Collective released a parody website named Google Nest, satirizing Google's privacy policies and practices with fake products imitating Google art style, supposedly created as a result "of an intensive period of studying user behavior" in response to the "public debate around privacy and government surveillance". The site described four purported new services lampooning Google's data gathering tendencies made possible with Nest's technology: Google Trust, Google Hug, Google Bee and Google Bye, respectively a "data insurance" paid with personal data, a location service encouraging in-person emotional interactions, a "personal drone", and a memorial website created from automatically collected information. The next day, Google trademark lawyers issued a cease-and-desist letter to Peng, asking them to change the site and to transfer the domain name to Google. The site replaced its content with a note explaining the situation, and the Electronic Frontier Foundation responded on behalf of Peng with a public letter saying that noncommercial political commentary is not prohibited under trademark law, and that the site wouldn't likely be confused after the ample press coverage received. ^ Bergen, Mark (June 3, 2016). "Who is Marwan Fawaz and can he get Nest back on track?". ^ a b Jacob Demmitt (November 18, 2015). "Google's Nest Labs plans top secret project at new Seattle engineering center". Geekwire. ^ Patel, Nilay (October 8, 2013). "Fire drill: can Tony Fadell and Nest build a better smoke detector?". The Verge. Vox Media. Archived from the original on October 8, 2013. Retrieved October 8, 2013. ^ "Say hello to Nest Cam". Nest Blog. ^ Levy, Steven (October 8, 2013). "Nest Gives the Lowly Smoke Detector a Brain — And a Voice". Wired. Condé Nast. Retrieved October 9, 2013. ^ a b "Is Tony Fadell the next Steve Jobs.. or Larry Page?". 2014-06-15. Retrieved 2014-06-15. ^ "Google to Acquire Nest". Google. 2014-01-13. Retrieved 2014-01-13. ^ Winkler, Rolfe; Wakabayashi, Daisuke (January 14, 2014). "Google Pays $3.2 Billion for Nest Labs". The Wall Street Journal. p. B1. ^ Constine, Josh (January 13, 2014). "Who Gets Rich From Google Buying Nest? Kleiner Returns 20X On $20M, Shasta Nets ~$200M". TechCrunch. Retrieved January 22, 2014. ^ Oreskovic, Alexei; Gupta, Poornima (January 14, 2014). "Kleiner Perkins, Shasta Ventures make about 20x their money on Nest Labs – Reuters". PEHub. Retrieved January 22, 2014. ^ a b Kumparak, Greg. "Nest is being rolled into Google's hardware team". TechCrunch. Retrieved 2018-02-07. ^ Ankit Ajmera (23 June 2014). "Google's Nest to buy Dropcam for $555 million". Reuters. ^ "Here's How Nest Will Work Together With Your Dropcam Now". Gizmodo. 9 September 2014. ^ Gannes, Liz (2014-10-24). "Nest acquires home automation hub Revolv but will stop selling it". Recode. Retrieved 2019-01-31. ^ "Nest Learning Thermostat and Nest Protect: Smoke + Carbon Monoxide Alarm Coming to France, Netherlands, Belgium and Ireland". Business Wire. 6 September 2014. ^ "Nest announces Nest Cam, new Protect smoke detector". Mashable. 17 June 2015. ^ "Google to be publicly traded under Alphabet Inc. in planned restructuring". Retrieved 2015-08-10. ^ "Leaving the Nest". 3 June 2016. ^ Yani Heisler (June 6, 2016). "Google's Nest acquisition was more disastrous than we thought". Yahoo! News. Retrieved June 8, 2016. ^ "Where the smart is". The Economist. ISSN 0013-0613. Retrieved 2016-06-15. ^ "Google and Nest reunite in push to add AI to every gadget". CNET. 2018-02-07. Retrieved 2018-02-07. ^ "Nest co-founder Matt Rogers is leaving the company just after it rejoins Google". The Verge. Retrieved 2018-10-02. ^ "Nest CEO steps down after employees pushed for his exit". CNET. 2018-07-17. Retrieved 2018-07-18. ^ "How do I update the software on my Nest Learning Thermostat?". Support.nest.com. Retrieved 2013-10-17. ^ Kumparak, Greg (30 August 2017). "This is the new, less expensive Nest Thermostat". TechCrunch. Retrieved 4 September 2017. ^ Reisinger, Don (30 August 2017). "Nest Doesn't Want You to Notice Its New Smart Thermostat". Fortune. Retrieved 4 September 2017. ^ "Where can I buy the black Nest Protect?". Retrieved 27 February 2015. ^ "Nest Halts Sales of Smart Fire Alarm After Discovering Dangerous Flaw - Slashdot". ^ Tilley, Aaron. "Google's Nest Stops Selling Its Smart Smoke Alarm For Now Due To Faulty Feature". ^ "Google-owned Nest halts sales of its Protect smoke alarm". April 4, 2014 – via www.bbc.co.uk. ^ "Nest Labs Recalls to Repair Nest Protect Smoke + CO Alarms Due to Failure to Sound Alert". CPSC.gov. 2014-05-21. Retrieved 2014-07-22. ^ By Tom Cheredar, VentureBeat. "/ Nest recalls 440K smoke alarms that shut off unintentionally." May 21, 2014. Retrieved May 22, 2014. ^ "Now it's a whole lot harder to compete with Nest". Fortune. Retrieved 2018-07-12. ^ Arsene, Liviu (March 21, 2017). "riple Flaw in Nest's Dropcam Opens the Door to Burglars". Retrieved October 18, 2018. ^ a b Bader, Daniel (March 31, 2017). "That potentially dangerous Nest Cam bug has been fixed". androidcentral.com. Retrieved October 18, 2018. ^ Ranger, Steve. "Nest Cam IQ Outdoor: Premium hardware and clever software make for a smart security package | ZDNet". ZDNet. Retrieved 2018-07-12. ^ Goode, Lauren (20 September 2017). "The Nest Cam IQ Outdoor is the latest security camera to use facial recognition". The Verge. Retrieved 20 September 2017. ^ Kumparak, Greg (20 September 2017). "Google Assistant is coming to Nest Cam IQ". TechCrunch. Retrieved 20 September 2017. ^ Lee, Nicole (20 September 2017). "Nest's vision of the secure home is rooted in simplicity". Engadget. Retrieved 20 September 2017. ^ Phelan, David (20 September 2017). "Nest Reveals Suite Of 5 Home Security Products From Doorbell To Motion Sensor". Forbes. Retrieved 20 September 2017. ^ Weinberger, Matt (20 September 2017). "Nest just announced a full-fledged home-security system for $499". Business Insider. Retrieved 20 September 2017. ^ "Nest Secure is a solid home alarm system at a high price". CNET. 2017-11-09. Retrieved 2018-01-25. ^ Weinberger, Matt (20 September 2017). "Nest just announced a full-fledged home-security system for $499". Business Insider. Retrieved 2 September 2018. ^ "[Update: Setup video, opt-in confirmed] Your Nest Secure becomes an Assistant-integrated smart speaker starting today". Android Police. 2019-02-06. Retrieved 2019-02-07. ^ Porter, Jon (2019-02-20). "Google claims built-in Nest mic was 'never intended to be a secret'". The Verge. Retrieved 2019-02-20. ^ Brown, Rich (20 September 2017). "Nest says Hello with a new doorbell camera". CNET. Retrieved 20 September 2017. ^ "Nest Hello pre-order page stating orders will ship in March 2018". ^ Gibbs, Samuel (2018-05-30). "Google launches video doorbell with facial recognition in UK". the Guardian. Retrieved 2018-06-12. ^ Ion, Florence (2018-05-03). "Nest Hello and Yale lock review: a smart entrance". The Verge. Retrieved 2019-02-20. ^ Whitwam, Ryan (5 October 2017). "Nest camera integration with Google Assistant is already live". Android Police. Retrieved 2 September 2018. ^ Davies, Chris (25 March 2016). "Amazon Alexa voice control for Nest's Thermostat is live". SlashGear. Retrieved 2 September 2018. ^ McGarry, Caitlin (4 January 2015). "Whirlpool's new washers talk to Nest while you're away". TechHive. International Data Group. Retrieved 2 September 2018. ^ Clark Thompson, Ashlee (3 January 2017). "Is something burning? GE ovens will work with Nest Protect smoke detector". CNET. CBS Interactive. Retrieved 2 September 2018. ^ Brinks, Kate (April 12, 2012). "Nest Counters Honeywell Allegations of Patent Infringement". Nest.com. Retrieved May 18, 2012. ^ "Allure Energy Files Patent Infringement Lawsuit against Nest Labs". Business Wire. 2013-05-15. Retrieved 2013-10-17. ^ "Nest Enters Into Patent Sale Agreement and License Agreement with Intellectual Ventures". Intellectual Ventures. 2013-09-11. Retrieved 2013-10-27. ^ "First Alert sues Nest over smoke detector patents on voice alerts and vents". The Verge. 2013-11-19. Retrieved 2014-01-14. ^ a b "Google Nest". Archived from the original on May 7, 2014. Retrieved 22 May 2014. ^ Kingsley-Hughes, Adrian (2016-04-04). "Nest to deliberately brick old smart hubs". ZDNet. Retrieved 2019-01-31. ^ Hern, Alex (2016-04-05). "Revolv devices bricked as Google's Nest shuts down smart home company". The Guardian. Retrieved 2019-01-31. ^ Finley, Klint. "Nest's hub shutdown proves you're crazy to buy into the Internet of things". 2016-04-05. Retrieved 2019-01-31. ^ Bode, Karl; Malberg, Emmanuel (2019-01-29). "Nintendo makes it clear that piracy is the only way to preserve video game history". Vice. Retrieved 2019-01-31. ^ "Closing Letter to Richard J. Lutton, Jr., Head of Legal and Regulatory Affairs, Nest Labs" (PDF). FEDERAL TRADE COMMISSION. ^ "Former Nest Employee Takes Aim at Google's Media Policy". The Information. Retrieved 2016-06-06. ^ "Nest employee fired for posting memes on Facebook, files case against Nest and Google – Tech2". Tech2. 2016-06-06. Retrieved 2016-06-06. ^ Jessica Hullinger. "How activists fooled the internet with these convincing new Google Nest products". Fast Co.Create. Fast Company. Retrieved 22 May 2014. ^ Ellen Huet. "Google Nest Spoof By German Activists Promises Eerie, Data-Driven Future". Forbes. Retrieved 22 May 2014. ^ Darrell Etherington (7 May 2014). "Google Nest Parody Protest Site Holds A Funhouse Mirror Up To The Search Giant". Tech Crunch. Retrieved 22 May 2014. ^ a b Joe Mullin (21 May 2014). "Google scolded for "polite trademark bullying" of parody site". Ars Technica. Retrieved 22 May 2014. ^ Corynne McSherry. "Re: google-nest.org" (PDF). Electronic Frontier Foundation. Retrieved 22 May 2014.